Won't rust, dent, chip or peel. Lightweight for easy maneuverability and quiet operation. No sharp edges to nick walls or furniture. Flat shelves provide a smooth worksurface and allow easy loading. Rubbermaid Commercial Flat Shelf Utility Cart, Two-Shelf, 25-1/4w x 44d x 38-1/8h, Beige - Large utility cart features two versatile flat shelves designed for transport of oversized, bulky items. Ergonomic push handle provides optimum hand placement and push height, improving control and worker safety. Use molded-in storage compartments, holsters, hooks and notches to carry loads with more safety and efficiency. 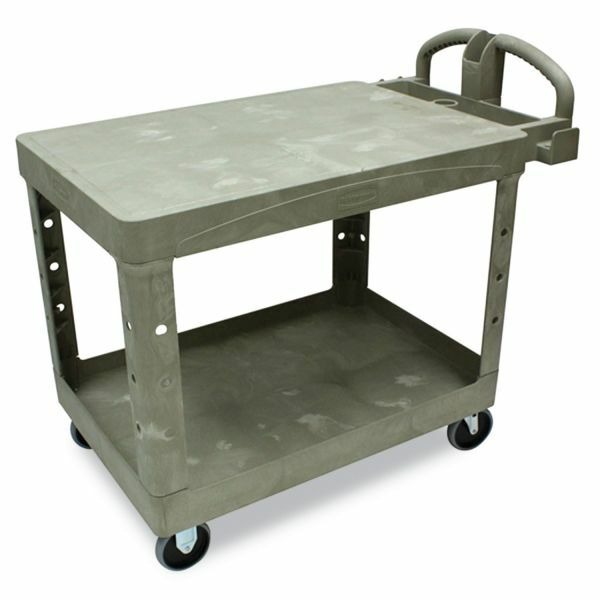 Cart also features molded-in customizable fittings and easy-access bottom shelf. High-density, structural resin construction resists rust and corrosion. Best-in-class casters meet the most demanding environments. Weight capacity is 500 lb. with a 250 lb. capacity for each shelf. Compatible with Optional Refuse/Utility Bins, Rubbermaid Commercial Optional Utility Cart Refuse/Utility Bin and Rubbermaid Commercial Utility Bin (sold separately). Molded-in wraparound handle with convenient storage bin. Front mounting bracket holds wastebasket, extension cord or power strip.